Where the first of this explosive trilogy had imitations spread rife across every bit and byte of media, the sequels are destined to rattle the uncreative houses yet again by laying a foundation to be plagiarized, from adverts to music videos and all encompassing areas. The machines are burrowing down to the city of Zion, the last underground vestige of humanity's resistance, standing together to fight the illusion of the Matrix. Neo's powers are increasing and Morpheus still believes in the prophecy. Trinity and Neo have become as close as two people can, adding a romantic element to the emphasis on the humanity factor - no, it's not a soppy one, but a very tasteful and necessary addition to the trilogy. The emphasis on the choice to regain humanity, results in many a philosophical discussion that may bore those who merely wanted to get blown away. Some things need explanation and justification, so be patient. With all ships called to fight the digging sentinels, Morpheus, Neo and Trinity defy orders to try and stop it all before it strikes. As to be expected, the slow-motion action is a fluid ballet of incredible choreography, photography and FX. Slick and stylish to say the very least. The freeway chase sequence is phenomenal. It is handy to have seen the first one before catching the sequels - experiencing the original on DVD will be the most fulfilling experience as you witness the nexus of a new breed of filmmaking in digital widescreen with extras digging into the rabbit hole of The Matrix. The extra material disc contains the expected behind-the-scenes looks and featurettes with interviews and fascinating peeps the technical stuff. The Freeway Chase making-of is phenomenal (they actually built an entire mile+ stretch of road, seamlessly integrating painstaking choreographed live action with digital images). You also get to take a look at some of the Matrix related advertising (cell phones, energy drinks). 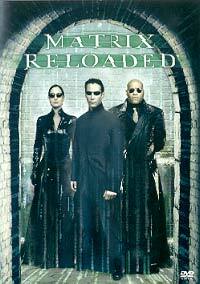 There's a making-of The Matrix game, a look at The Animatrix and the hilarious MTV Movie Awards segment where Reloaded footage was intercut with hosts Sean William Scott and Justin Timberlake's banter. …and then… We have certainly become more jaded as digital technology improved - Jurassic Park had us gaping in awe, now, as Keanu fights off a flood of Agent Smith's, we think in the back of our heads, hmm, check out the digital Neo…that's entertainment I tells ya.